The Serenata a 3, RV 690, is the oldest and in certain respects the most enigmatic of Vivaldi’s known serenatas. e libretto transports to the allegorical plane the story of the cleric from Toulouse Jean de Tourreil, which unfolded against the background of the great doctrinal controversies that broke out in Italy following the spread of Jansenist ideas during the pontificate of Clement XI. Even if many questions about the origin of Vivaldi’s score still remain unanswered, it is likely that the work was commissioned and performed in Rome around 1715 at the behest of a patron close to the composer and directly involved in the a aire Tourreil. 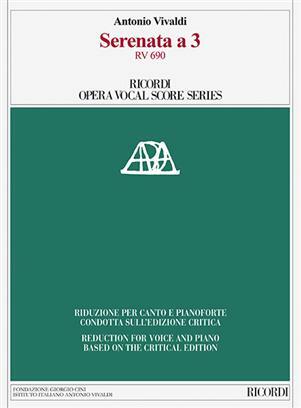 e present reduction for voice and piano, prepared by Antonio Frigé, is based on the critical edition of the score prepared by Alessandro Borin (publisher Ricordi, Milan, 2011).